A picky toddler can make dinnertime feel like a nightmare. Here's what to do when Baby won't eat. You've heard the horror stories: toddlers who will only let PB&J or white rice pass through their lips for weeks on end. Sadly, the rumors are true. "The majority of kids go through a rebellious eating phase," says Christine Wood, M.D., a pediatrician in Encinitas, Calif., and author of How to Get Kids to Eat Great and Love It. Stay calm and continue offering new nibbles. "By age 2 or 3, most food preferences have been determined, and kids don't add a lot of new foods after that. The first few years are definitely your setup zone," Wood says. While there's no guarantee your child will magically start begging for veggies, use these tricks to up the odds. 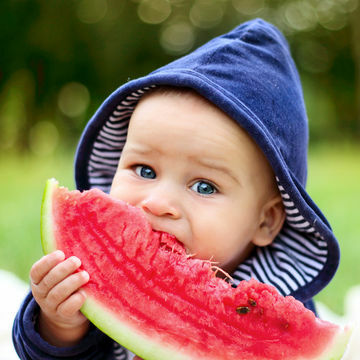 You may need to offer new food to a baby as many as 15 to 20 times before he'll get into it. But stick with it rather than serving up only his mainstay meals in the interest of getting him to eat something. While it might be tempting to hide veggies in sauces and sides, serve food in its natural form. By being honest about what's on the table, your tiny tablemate can get used to the taste and know exactly what he's eating. Kids' appetites change all the time. Maybe your little guy puts away a great breakfast or lunch and a so-so dinner—or eats well one day and not so great the next. That's OK! "Look at what he's eating over three to four days and not just in a single day," Wood advises. "Things might actually be a lot better than you think."